A/W is the season for special occasions - from birthday parties to Christmas nights out, we bet that over the next few months your social calendar will be bursting with events that you need that special something for. We’ve all got the reliable LBDs and bodycon dresses tucked away at the back of our wardrobe, but sometimes you need an occasion dress unlike any other. This season we’ve chosen our top three occasion dresses for A/W 16 and we guarantee these looks will make you stand out from any crowd! The cut-out trend is huge this season and it’s perfect for occasion dresses as it adds an instant edge to your outfit. If your personal style is more Kim Kardashian than Taylor Swift then this is the look for you. This dress is made from a soft stretch fabric that creates a flattering fit and has a subtle sheen finish. It has cut-out detailing at the bust with eyelet features and two simple shoulder straps. Add some strappy stiletto heels to this dress for a knock-out party look! 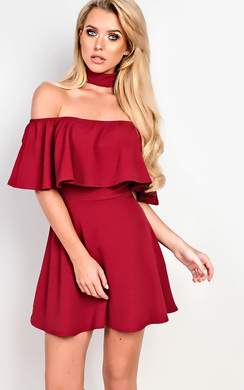 Finding occasion dresses that flatter your figure can be difficult, but we think we’ve found the solution - the Alise Off Shoulder Bodycon Dress is made from a a stretch fabric that looks amazing on any shape or size. It is an on-trend off shoulder style and has flared sleeves, which creates a gorgeous feminine look. Pair this dress with a retro gold choker and some killer heels and you’re ready to go. Lace is one of our favourite styles when it comes to occasion dresses, as it always looks on-trend and super glam. Right now we’re obsessed with the Roseanne Lace Strappy Bodycon Dress, which is made from a gorgeous lace fabric and comes in a stunning royal blue colour. It is has strap detailing at the neckline and is a classic mid-length style that will look oh-so-chic no matter what the occasion. Add the perfect touches to your occasion dress by adding some thick hair extensions and a simple clutch bag. Your stress-free occasion outfit is sorted!